One more enchantment Turkey tourist attractions, which managed to steal the attention of local and foreign tourists, Pamukkale. This is a natural hot spring pool that is always full of visitors. The water is warm and the shape that resembles a frozen waterfall, not to be missed. Pamukkale become one of top tourist attractions in Turkey. If during the hot tub-shaped swimming pool, now is the time trying to bath directly in the source. If you are on vacation to Turkey, visit to Pamukkale. This is a hot spring flows that exist in Turkey. 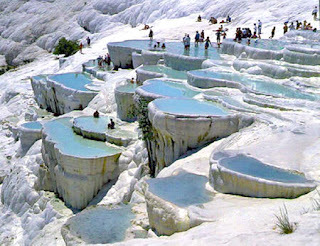 Pamukkale could be the right choice for you who like to relax muscles with a bathing in hot water. Pamukkale is a natural site which is located in Denizli, Turkey. Here, you can see the natural hot water pools and other gorgeous than usual. In Turkish, Pamukkale means cotton castle. As the name implies, these hot springs looked like a pile of white cotton. The white color comes from hydrogen carbonate and calcium contained in hot water. Content in hot water due to the ever increasing, the long-time location of the hot water discharge is formed as a layer of white limestone and resemble frozen waterfalls. Overall, this hot spring has a length of 2700 meters, a width of 600 meters, and height of 160 meters. Yes, this hot springs is quite large because the form of 17 hot springs which merge into one. Water temperature in Pamukkale reach 35 degrees Celsius to 100 degrees Celsius. 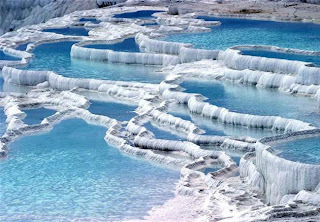 The attraction is the Pamukkale which the most powerful white cliffs formed from the content of the hot water, then freeze and form such a frozen waterfall. Beauty is what makes a successful Pamukkale as mandatory stops the backpacker and traveler. Typically, visitors take advantage of Pamukkale hot springs as a spa or therapy. Visitors to believe, with a soak in the hot tub drain mineral-rich content, can treat rheumatic diseases, skin and nervous exhaustion. However, not infrequently also come just for fun sightseeing and take pictures. Now, Pamukkale has officially become one of the UNESCO world heritage site. Let's put this place into a list of your trip to Turkey.